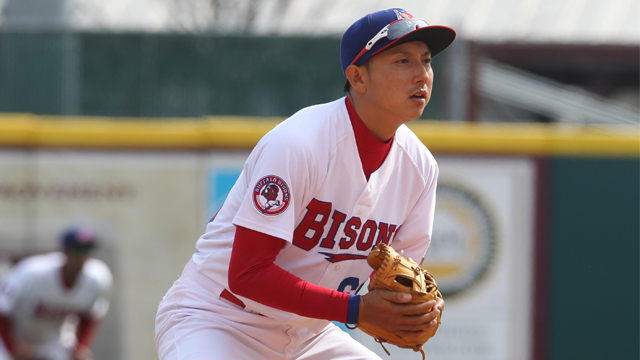 The Toronto Blue Jays today announced that they have purchased the contract of INF MUNENORI KAWASAKI from the Bisons. The club has also activated LHP J.A. HAPP from his MLB injury rehabilitation assignment with the Herd. To make room on their roster, the Blue Jays optioned C ERIK KRATZ to the Bisons on Sunday and he has been activated by Buffalo today. Toronto also announced today that RHP JEREMY JEFFRESS has cleared waivers and has been outrighted to the Bisons and Herd RHP MARCUS WALDEN has been designated for assignment. KRATZ has played six games with the Blue Jays this year with a .200 (2-10) average to go along with a home run and four RBI. He homered in Toronto's first game of the season, hitting a pinch hit home run in the Blue Jays' 9-2 loss in Tampa Bay on March 31. KRATZ is a three-time International League All-Star, receiving the honor with Indianapolis in 2009 and Lehigh Valley in 2010 and 2011. Last season, he played a career-best 68 games with Philadelphia and hit .213 (42-197) with seven doubles, nine home runs and 26 RBI. JEFFRESS pitched in 25 games for the Bisons last season and was 1-0 with a 1.65 ERA and seven saves. He struck out 28 batters and allowed just 22 hits in 27.1 innings of work. Jeffress pitched in three ballgames for the Blue Jays this year and allowed four runs in 3.1 innings of work (8 H, 3 BB, 4 SO). Kawasaki hit .240 (6-25) with a double and an RBI in eight games with the Herd. Walden is 0-1 with a 13.50 ERA in three games with the Bisons this year (4.0 IP, 5 H, 3 BB, SO). Happ started for the Herd on Thursday night and struck out six in 4.2 innings of work in a no-decision to Pawtucket (5 H, R, ER, 2 BB).